At its most fundamental level, momentum is a means of assessing the relative levels of greed and fear in the market at any given point in time. Securities ebb and flow, surge and retreat, and such action is measured by oscillators which are powerful leading indicators of the security’s immediate direction and its speed. Oscillators are most useful and issue the most valid trading signals when their readings diverge from prices. A bullish divergence occurs when prices fall to a new low while an oscillator fails to reach a new low. This situation demonstrates that bears are losing power, and that the bulls are ready to control the market for the stock or index again and such divergence often marks the end of a downtrend. Bearish divergences signify up-trends, when prices rally to a new high while the oscillator refuses to reach a new peak. In this situation, bulls are losing their grip on the security, prices are rising only as a result of inertia, and the bears are ready to take control again. – compares a security’s closing price to its price range over a given period of time. The theory behind this indicator is that in an upward-trending market, prices tend to close near their high, and during a downward-trending market, prices tend to close near their low. There are two components to the SO: the %K which is the main line indicating the number of time periods (usually 14), and the %D which is a three-period moving average of the %K. Buy/sell signals occur when the %K crosses above/below the %D. A %K result of 70 (or 30), for example, is interpreted to mean that the price of the security closed above 70% (or below 30%) of all prior closing prices that have occurred over the past 14 days and assumes that the security’s price will trade at the top (or at the bottom) of the range in a major uptrend (or downtrend). A move above 80 suggests that the security is overbought and therefore should be sold while a move below 20 suggests that the stock or index is oversold and, as such, is a buying signal. 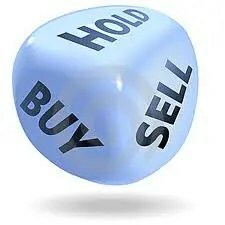 The SO, which ignores market jolts, is an ideal companion to the MACD (See http://www.munknee.com/2010/07/timing-the-market-using-trend-indicators/) to provide an enhanced and more effective trading experience. Using the two together gives traders an opportunity to hold out for a better entry point on an up-trending security or to be more sure that any down-trend is truly reversing itself when bottom-fishing for long-term holds. However, on the downside, because the stock or index generally takes a longer time to line up in the best buying position, the actual trading of the security occurs less frequently, so you may need a larger basket of stocks to watch. – compares the magnitude of recent gains in price to recent losses in an attempt to determine overbought and oversold conditions of a security. The RSI, on a scale of 0-100, indicates that a stock is overbought when it is over 70 and oversold when it is below 30. Because large surges and drops in the price of a security will create false buy or sell signals the RSI works best when it is used in conjunction with short-term moving average crossovers such as the Stochastic Oscillator to confirm a directional shift. – created by applying the Stochastic Oscillator to the Relative Strength Index values rather than standard price data thereby giving the trader a better idea of whether the current RSI value is overbought or oversold – a measure that becomes specifically useful when the RSI value is confined between its signal levels of 30 and 70. – displays the percent rate-of-change of a triple exponentially smoothed moving average of a security’s closing price and is designed to filter out stock movements that are insignificant to the larger trend of the security. The user selects a number of periods (such as 15) with which to create the moving average, and those cycles that are shorter than that are filtered out. TRIX is also a leading indicator and can be used to anticipate turning points in a trend through its divergence with the security’s price. – an oscillator which quantifies the relationship between the security’s price, a moving average of the security’s price, and normal deviations from that average to determine when a security has been overbought or oversold. The CCI, when used in conjunction with other oscillators, can be a valuable tool to identify potential peaks and valleys in the security’s price, and thus provide investors with reasonable evidence to estimate changes in the direction of price movement of the security. – measures the percentage rate of change, indicating the strength of the momentum, between the most recent price and the price over “x” periods (the narrower the better) thereby identifying bullish or bearish divergences. As such, the ROC is able to forecasts sooner than almost any other indicator an upcoming reversal of a trend and whether or not a security’s price action is created by those over-buying or over-selling it. A number other than zero (a personal choice) can be used to indicate an increase in upward momentum and a number less than zero to indicate an increase in selling pressure. There you have it – an extensive and in-depth assessment of how to evaluate buy/sell decisions for any security be it stocks, warrants, ETFs, gold, silver, etc. If ever there was a “cut and save” investment advisory this article is it! Thanks for reading! If you want more articles like the one above visit our Facebook page (here) and “Like” any article so you can get future articles automatically delivered to your feed. You can also “Follow the munKNEE” on Twitter or register to receive our FREE tri-weekly newsletter (see sample here , sign up in top right hand corner). Remember: munKNEE should be in everybody’s inbox and MONEY in everybody’s wallet! Hi, Is it possible to get a backlink from you guys for the above site. How much would be the monthly cost? Sorry, but we don’t provide backlinks.